Round 2 of the U.S. 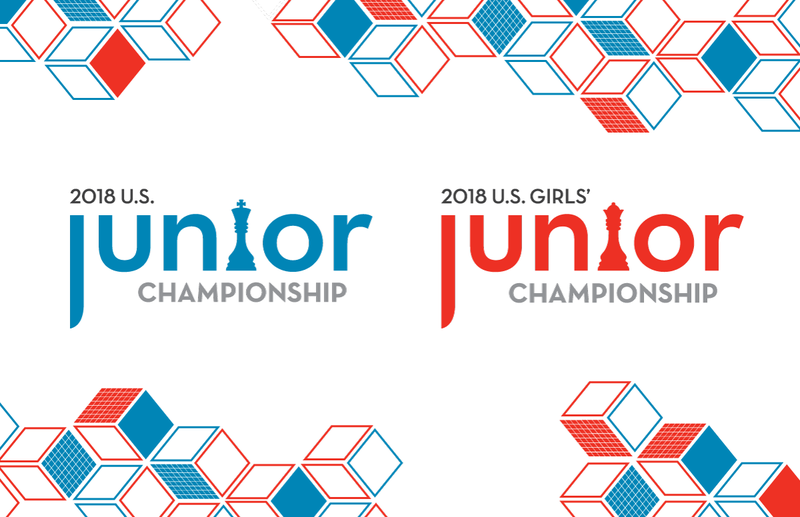 Junior Championships was a round of many surprises. Three underdogs, Annie Wang, Alex Bian, and Rochelle Wu, won upset victories over tournament favorites. 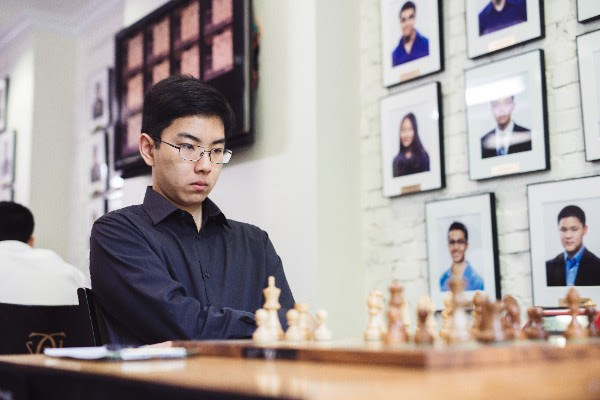 FIDE Master Alex Bian played the game of the day when he gained his second grandmaster upset win in a row with his cool-headed defensive skills. GM Andrew Tang inaccurately gave up a piece to open up Bian’s kingside. Though his king was under pressure, Bian retained his extra material and defended precisely to secure the victory. Annie Wang achieved an even bigger upset in terms of rating against top seeded Ruifeng Li. Li won a pawn in the middlegame, but Wang focused on gaining compensation through piece activity. On move 33, Li shockingly blundered, allowing a backrank tactic that Wang had no trouble finding. This win is Wang’s second ever victory over a grandmaster. On the other hand, for the second year in a row, Li enters the tournament as the top ranked player and begins with a half point out of 2. Can he recover in the following rounds? 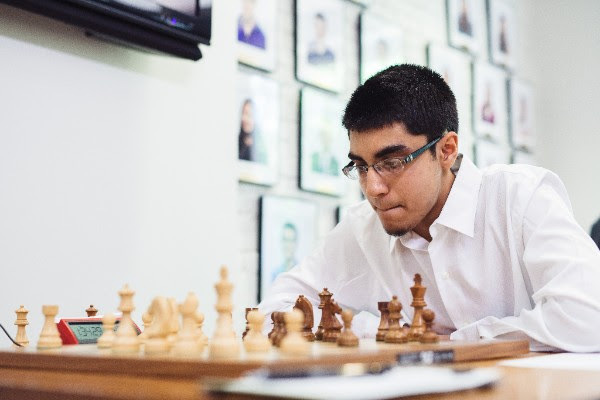 Mika Brattain vs. Advait Patel began as a thrilling King’s Indian Attack position where Brattain actually had to “un-castle” his king, bringing it back into the center to evade Patel’s immense kingside pressure. 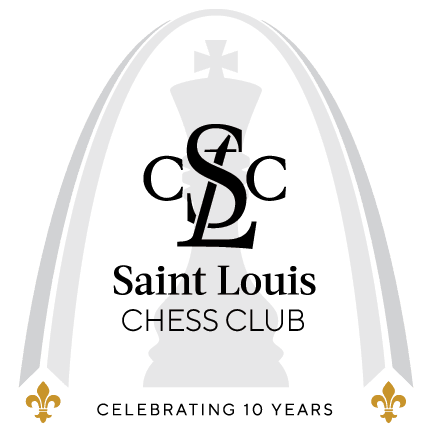 Brattain’s king managed to survive a very complicated middlegame, running to the queenside, and the players found themselves in an imbalanced but level ending. Patel had two knights and a doubled isolated extra pawn while Brattain had a bishop and knight. In time trouble, Brattain missed the best endgame defense, and Patel gained the full point. Praveen Balakrishnan vs. Akshat Chandra was a topsy-turvy Benoni struggle. Despite the heavily dynamic middlegame, play eventually fizzled out into a draw when several pieces were liquidated. Today’s grandmaster matchup, Awonder Liang vs. John Burke, went into a level rook and bishop endgame fairly early on the 24th move. Though both players tried to make progress for a while, after a couple more exchanges, the players agreed to a draw. Alex Bian and Advait Patel continue to be the unexpected leaders of the Junior section, each with perfect 2-0 scores. Competitors in the Girls’ section came to play for glory today—every single game was decisive! The game of the day in the Girls’ section was definitely Rochelle Wu’s victory over Top Seed Jennifer Yu. Although Yu had an advantage for much of the middlegame, she underestimated Wu’s queenside counterplay. On move 38, Wu noticed a key possibility in 38...b3!, allowing her to bring her queen into the heart of Yu’s position and gobble up several weak pawns. Wu reached the rook endgame with three extra pawns and gradually converted into a victory. 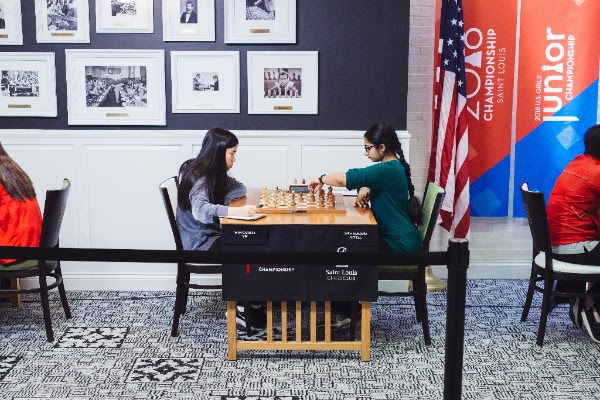 In Carissa Yip vs. Sanjana Vittal, Vittal played actively, planting an “octopus knight” on d3, but the knight ended up pinned and poorly supported. Eventually Yip won the knight tactically and the game. 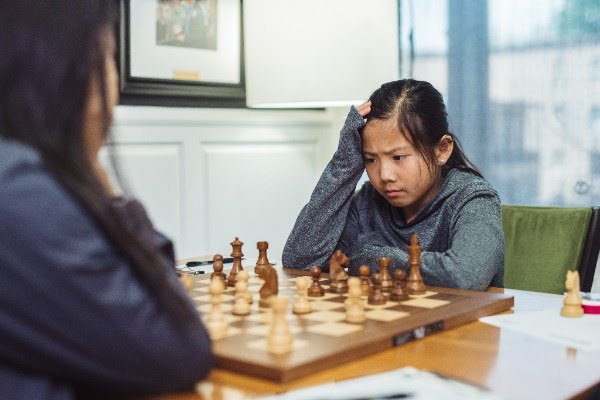 In her game against Nastassja Matus, Maggie Feng also achieved an octopus knight on d6. Her knight was well-supported though, and she used it to put pressure on her opponent’s queenside. Eventually, she gained an extra pawn—an outside passed a-pawn—which she gradually advanced down the board in the resulting queen ending. 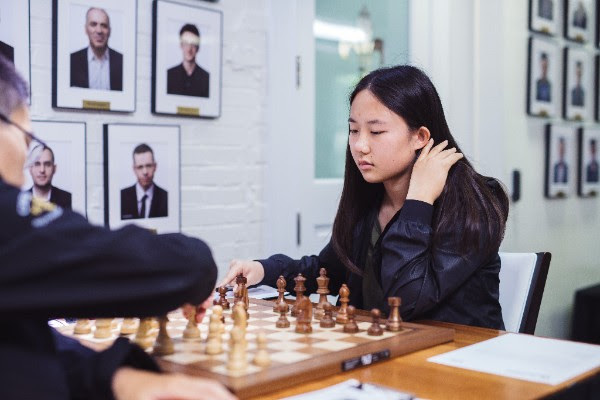 When Feng also gained considerable pressure on her opponent’s kingside pawns, there was no defense, and Matus resigned down four pawns in a king and pawn ending. Sophie Morris-Suzuki vs. Thalia Cervantes was a balanced game until move 31, when Cervantes found a shot on the kingside, opening up Morris-Suzuki’s already somewhat loose kingside and quickly mating. 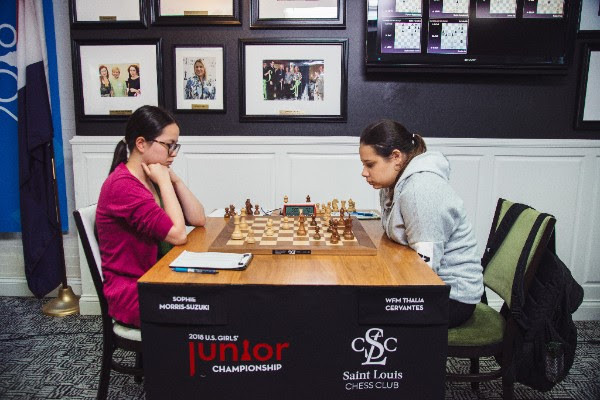 Martha Samadashvili vs. Emily Nguyen was level until they reached a king and pawn ending when Nguyen gained a more active king. As is often the case in these kinds of endings, that in itself was enough to win the game. Next round, the tournament leaders, Carissa Yip and Emily Nguyen, are paired against each other. Get ready for an exciting matchup and possibly a sole leader by the end of tomorrow. One thing is clear—It’s tough to be a top seed, and no one in this event should be underestimated!